No. 44, Jalan Pengasah 3, Batu 4, Jalan Kapar, 42100 Klang, Selangor, Malaysia. Since 2005, TSM had a single goal. 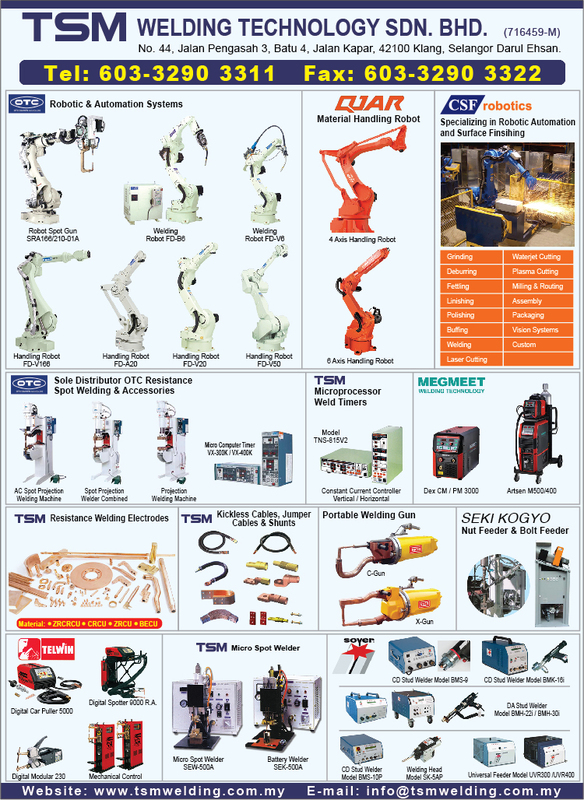 Provide Best Resistance Welding Facilities, Service And Technical Know-How. The company’s one and only focus is Resistance welding technology. Its single-minded mission — provides customers throughout the world with the best Resistance Welding equipment and service available in the industry. That’s why TSM co-operate NASH Robotics & Automation and British Federal and others. To provide the Best resistance welding manufacturing-line facilities, Equipment and services. TSM Welding Technology used to provide products that facilitate the production of heavy equipment for Aerospace, Defense and Steel Work Industries. Aid in the manufacture of the world's most prestigious Automotive & Motorcycle. Enable Motor Car and Motorcycle to safely ride on the road of the globe. Keep international airlines flying. Allow the smallest welding operations to be competitive. Help noted artists create imaginative sculptures.